Book Publishing in the 21st Century. Copyright © 1991, 1993, 1996 by J. Neil Schulman. All rights reserved. "Informational Property: Logorights" was published in The Journal of Social and Biological Structures, JAI Press, 1990. Copyright © 1983, 1989 by J. Neil Schulman. Foreword copyright © 1996 by J. Neil Schulman. All materials created for SoftServ Publishing Services, Inc., copyright © 1996 by J. Neil Schulman. Volume 2 compilation copyright © 1996 by J. Neil Schulman, and non-exclusive reproduction rights of writings drawn from the SoftServ RoundTable assigned back to their respective authors. No part of this book may be used or reproduced in any manner except in the case of quotations embodied in critical articles and reviews. This edition has been previewed using Netscape Navigator® Version 3.0. Optimal results will be achieved using Netscape Navigator® to read this book. Users of Microsoft Windows® Version 3.1 might need to download the file Nullsock.Zip from Pulpless.Comtm to enable offline use of your web browser. Microsoft Windows95® and Apple Macintosh® users will find that their web browser is already functional while offline. Unix users should rename ".htm" file extensions ".html." The rights to all previously published materials by J. Neil Schulman are owned by the author, and are claimed both under existing copyright laws and natural logorights. The usage rights granted to readers of this paperless booktm are limited by the License Agreement. Author photograph of J. Neil Schulman by Kevin Merrill. Appendix 1: "Here Come the Paperless Books!" Appendix 2: "Informational Property: Logorights"
It was periodically augmented and updated. SoftServ Paperless Bookstore BBS was opened. New books published on SoftServ by Cadenza Communications, Inc. File included in downloaded paperless books. "Paperless Books" by J. Neil Schulman, President of SoftServ Publishing. A general introduction to paperless book publishing. Introduction to The SoftServ Toolkit. Documentation on SoftServ's "Digital Signatures"
represents a discussion topic in that category. What you are about to read is a set of paradoxes. It is a book which talks about the future but which takes place in the past. So, it will perhaps be of as much interest to those who are interested in the history of "paperless" book publishing as it is to those who are interested in its future. In my writings, I've been a fairly good prophet on a number of things, but, interestingly, I never managed to predict the two specific forms of electronic book distribution which I have primarly used in my two ventures. In my novel, The Rainbow Cadenza, completed at the end of 1981, I have scenes where my heroine, Joan Darris, reads books on discs using a handheld reader. I show her purchasing one of these discs in a store called "Civilization And Its DisContents"--which I still think is a pretty funny play on the title of Freud's seminal essay. But it never occurred to me in 1981 that she might bypass retail distribution completely by downloading the book directly onto the reader. Further, when I was writing the business plan for my first paperless publishing venture, SoftServ Publishing, it never crossed my mind that the Internet would become in only a few short years a network which, by allowing commercial ventures, would drive the existing dial-up computer networks and bulletin-board systems into near extinction--and solve every formatting, software, and distribution problem which was making my first entry into paperless publishing a personal financial disaster. When I finally closed the "doors" on SoftServ, I knew that all I had to do was wait a few years and the problems I'd been facing would solve themselves. And I did, and they did, and here you are reading this. In spite of its never breaking even, much less showing a profit, I consider SoftServ Publishing to be a complete success in testing the "paperless book" concept, and proving it viable. In looking back at what we all accomplished, I am all the more impressed. We had a good list of books written by impressive authors such as Harlan Ellison, Robert Silverberg, Robert Anton Wilson--and two authors you'll recognize from their participation in Pulpless.Comtm, Victor Koman and Keith Kirts. We did a good deal of market research on the problems that need to be solved to make paperless editions attractive to book readers. We discovered a lot about the special needs of the visually impaired. We had our share of controversies, headaches, and heartaches. But, overall, we had an awful lot of fun. 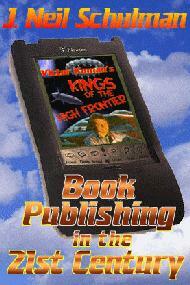 Book Publishing in the 21st Century appeared once in an earlier electronic edition from SoftServ. That edition used an early hypertext program called DART to read it. DART worked only on MS-DOS systems, had no ability to integrate graphics into text, had no font controls, and was extremely difficult to understand. Perhaps we on the World Wide Web may still feel like we are in the age of the Model-T sometimes, but at least we have paved roads and vehicles that run more than they break down. In the days of SoftServ, we were driving on potholed, dirt roads, and we had to get out and push every few miles. This new edition includes not just the original course I taught via computer conferencing for Connected Education/The New School, but I'm also including, in a second volume, some of the vital history of SoftServ. The first resource in Volume II contains almost a four megabyte plaintext database with all the public discussions of the SoftServ Bulletin Board in the SoftServ RoundTable on GEnie -- the General Electric Network for Information Exchange. GEnie was the most economical computer network for its time--averaging half the costs of its best competitor of the time, CompuServe--and I believe it is the only network that could have made what we did at time as successful as it was. In this collection of computer messages, archived by category and topic, you will find discussions not only directly on subjects relating to SoftServ and electronic publishing, but also to a wide range of topics -- everything from literature to politics to what you should snack on while reading a paperless book. In here you'll find article-length essays by myself, Victor Koman, James Audlin, Paul Levinson, Keith Kirts, and other pioneers of this medium. The second volume also contains the final version of the SoftServ Toolkit, the set of resource files we distributed to publishers, authors, media, and any customers who were interested in learning more about what we were doing. Finally, I have selected the best Real-Time Conferences from the weekly conferences we held each week on GEnie--on such topics as literature, the causes of AIDS, cyberspace, literacy, guns, and discordianism, with such authors as Robert Anton Wilson, L. Neil Smith, Victor Koman, and Jon Rappoport. All these files in Volume II are plaintext. You can read them using your web browser (there's no HTML coding so it will just give you the text as it appears) or load them into any word processor or text editor to read them or print them out -- just like in the old days. It will become apparent, if you choose to wade through Volume II, how many people spent a good deal of their imagination and lives to make SoftServ an exciting expedition into the future. I certainly wasn't able to thank them by making money for them, so let me now take this opportunity to thank all of our publishers, authors, and supporters, with particular thanks to Victor Koman and Kate O'Neal, who served with me as officers of the corporation and were always there for the dirty work (they're still with us -- Victor's new meganovel Kings of the High Frontiers is one of our biggest sellers and you can hear Kate singing the Pulpless.Comtm radio jingle on our website); Paul Levinson, James Audlin, Keith Kirts, and Nick Dotson--who gave freely of themselves to authors and customers alike ... and to everyone from GEnie who participated in discussions in the SoftServ RoundTable. We made history, guys ... and here's my chance to begin showing the world just what we accomplished. On April 1, 1991, I began teaching a class for The New School in New York which ended in June, 1991. The title of the class was "Book Publishing in the 21st Century." The class was part of a Master's program in Media Studies, and students ranged from a vice president with the largest book publisher on the east coast, to TV and radio news executives, to a computer company sales executive going for an MBA. All of the students lived in the New York area. I was living in Hollywood at the time I taught the course, and never left Los Angeles for its duration. What resolved this seeming paradox is that the class was taught via a computer conferencing program which Connected Education, Inc., of New York City ran under contract to The New School. I sat at my computer and dialed up a computer in New Jersey via modem, and so did the students. The "classroom" was a computer messaging system. I left messages for the students; they left messages for me. Book Publishing in the 21st Century is the record of my course material--the messages I left for the students. My comments from the class are verbatim. In the following presentation, I have fictionalized names and comments of the students to protect their privacy and comply with Fair Usage provisions of the copyright laws. In my course material, I tried to ask what the impact of computer communications will be on the print publishing industry. I utilized my experience as founder and president of SoftServ Publishing Services, Inc. (now defunct), which was the first company to offer a line of books by major authors via modem and on computer floppy disk. I included as part of the course my original business plan for SoftServ, and additional articles of mine related to the course topics. If you want to know whether the book you buy in the twenty- first century will be bound and printed--or as text which you read from a pocket-size electronic screen--this paperless book will clue you in. You are the only member active. No items have been written. of java before we started ... then got lost on the way back. want. But leave the brownies back in the cafe where they belong. I'm supposed to be on a diet. to pretend that we are. a mystery to me -- and who are God Knows Where reading this. something physical that you hold in your hands? years now. I have been selling what I call "paperless books"
the text to their liking and print it out before reading it. of book publication and distribution during the 21st Century. published in both hardcover and paperback by major publishers. special thrill at seeing my books on the shelves of libraries. have been spent with a book in my hand than anything else. incorporeal "thing" which an author writes and a reader reads. for me, is taking down the Berlin Wall of "retail marketing"
Roberts Connected Education Library (+LIBRARY). Connect Ed library as +nopapro. printed books in the marketplace. an artifact as "real" as a physical bound book. to a deeper and more practical discussion of the subject. experience compares to reading a traditional bound book. introductions from each of you, and any initial questions you have. Do I "see" any "hands"? Go to Lesson Seven: "Paperless Books". some considerable updating as well. So I decided to upload it here. think will address some of the comments you all have been making. interested in reading that composed Work. little mediation between them as possible. to have it unceasingly available to all Readers who desire it. painlessly as possible, whenever and wherever desired. closely approach the ideals of both Authors and Readers. not of the carriage but of the horse. racetrack and at the riding academy. So it will be, I expect, with "Paperless Books." surely as did the Horseless Carriage, and for the same reasons. better than bound books at getting Works from Author to Reader. their times, in the largest quantity and lowest price possible. judged is by their covers. what editors wish to buy for publication. it comes to creating display space for a book. Retailers consider book-purchasing largely an impulse "buy"
as a remainder unprofitable to either publisher or author. payment to publishers for another month. denominator to sell at mass-market quantities. not few units of many products. packaging sell it on the shelf. products already available, and selling them as "just as good." customer will know where to find it. what books are publishable today. on celebrity books, movie and television tie-ins, "formula"
risk is almost never taken. By rule four, literary invention is an undesirable risk. warehousing, and (for paperbacks) destruction. production--because the acquiring editor has left the company. electronic media are, for all practical purposes, unlimited. Storage costs approach zero: about $1.00 per Work, period. Manufacturing cost before placing a title on sale: $0.00. modem in somewhat more minutes--but minutes nonetheless. while every order can be filled as if it were a special order. destroyed copies. We can reduce inventory to one copy per title. can make it available in all marketable categories. the same profitability as one title selling very well. publication approaches its being a non-existent market feature. retailer) can approach that of hardcovers. to describe in twenty words or less. brilliant--which is often the case. to sell one the wrong year, tough luck. received by the author who created it. they are likely the only ones who'll show up. bestseller list is a Shangri-La, never to be found. to make a full-time living out of writing. Work on which an electronic bookseller can't take a chance. of a Work, leaving only crumbs for the Author. marketing and electronic dissemination services. will be free to contract elsewhere for these services. their client's Works for electronic publication. authors are held back as "reserve against returns." returns" because there will be no returns. packaging, and promotion of the Work. Author's Problem 5: Little or no advertising for the Work. Author's Problem 6: Few reviews of a Work. such as GEnie and Compuserve. question, "How did I ever put up with it?" I know you just saw the author on TV, but--"
"We don't have it in yet." "The library only has one copy, and it's out." "We just sent all our copies back to the warehouse." "It's out of stock at the distributor." "We only have volumes two and three of the trilogy." "It's out of print from the publisher." "I haven't seen a copy of that for years." library to carry that book." Student Council to be racist or sexist." "We burn books like that!" off all telephone service or banning computers and modems. unavailability: many hardcover books never sell to paperback. Works available electronically a year before the first printing. storable on one compact disk. Reader's Problem 6: Shipping weight of books when moving. Solution: Take the shoebox (or CD) with you when you move. Reader's Problem 7: Small type. Reader's Problem 8: Difficulty of replacing worn-out copies. onto a permanent medium such as CD-ROM will store it permanently. it ready for the creation of a new printed copy at will. in a book, or a particular scene, or a character. Reading Dysfunctions, or English-language difficulties. have a voice synthesizer read them aloud. Or just the latter. in determining which Works are worth purchase. media then selling them to book publishers. VI. Why Hasn't It Happened Yet? standard that can universally integrate text and graphics. outweigh its disadvantages are, however, visible on the horizon. America and Europe by the end of 1991.
prepared to pay for their use. package to be engineered and marketed. and bulletin-board systems, both nationally and internationally. to read on the plane than the in-flight magazine. "DOWNLOAD," and the screen tells you "READY TO SEND." you want to apply your points to frequent-flyer miles. your pocket, and head for your plane. buy a pack of chewing gum. It costs you another $2.95. you'd have to choose from at the airport newsstand today, no? [This article is updated from "Here Come the Paperless Books,"
Go to About The Author.